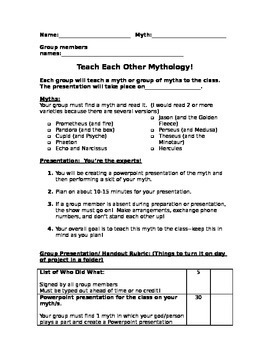 I use this project when introducing mythology and The Odyssey to my 9th grade English students. 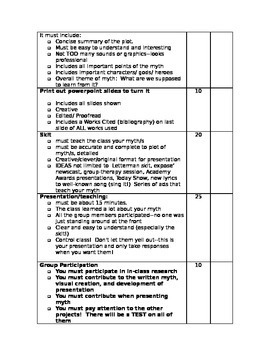 Each group of 4-5 students is assigned a myth; they read it together, summarize it, and then find a creative way to present it to the class. We use copies of Edith Hamilton's Mythology to read the myths, but other versions are available online. The students had a lot of fun with this project! 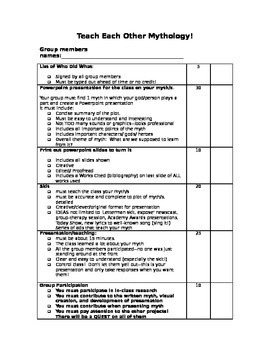 I've included rubrics for assessment and for peer review of the presentations.